Fissure sealants refers to the use of an adhesive, white resin material to restore or patch the chewing surfaces of your teeth in order to prevent tooth decay. It is most commonly used on premolars and molars, where it bonds with the depression and grooves to create a protective sheath over the existing enamel. 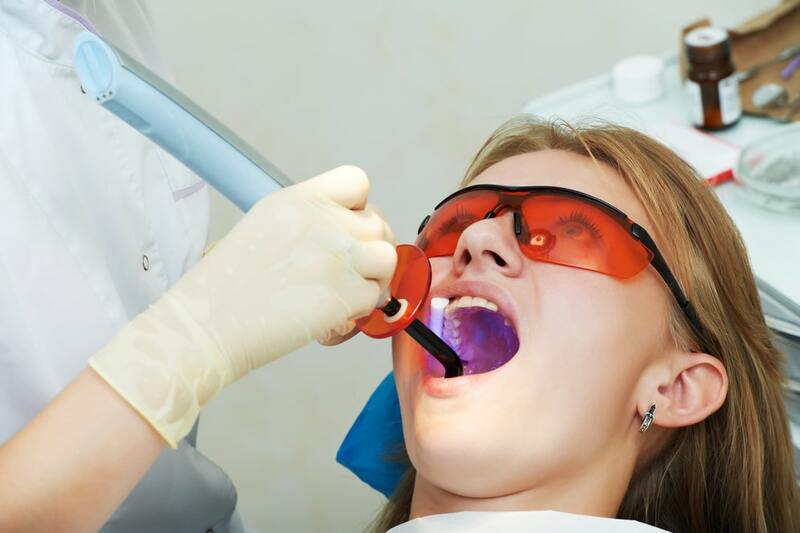 So, How Do Sealants Prevent Tooth Decay? The grooves and chips in our teeth harbour food particles and plaque. Food particles and plaque are difficult to remove with brushing or flossing, so your risk of getting tooth decay are increased. Fissure sealants cover the grooves and chips in the teeth, so plaque and food cannot enter, effectively ‘sealing out’ decay. When Should Fissure Sealant Be Used? Decay occurs in all stages of life. Your dentist may suggest fissure sealant as soon as he/she notices any depressions or grooves that are likely to cause an issue. In fact, it is best for children to get a sealant placed on their permanent molar and/or premolars as soon as they erupt. This is an excellent form of preventative medicine and will protect the teeth of children, between the ages of 6 and 14, when cavities are most prevalent. Your dentist may even suggest the sealing of baby teeth, to prevent premature loss of baby teeth due to tooth decay. A hygienist or dentist will scale and clean each tooth in order to create a clean environment to apply the seal. Once each tooth is dry, an absorbent material will be used to dry the tooth and to keep it dry. Depending on how rough the surface of the tooth is, additional etching may be required in order to maximise bonding. Once the appropriate surface conditioning has been achieved, the teeth will be rinsed and dried. The sealant, which is made of a tooth-coloured, composite material, naturally bonds to the tooth as it hardens. A ultraviolet curing light is used to speed up the process and creates a strong and reliable bond. The process is essentially the same as that which you would expect from a tooth filling. The beauty of the process is that NO anaesthetics is required and it uses a liquid material, so it suits all types of teeth and there is no need to send anything off to the laboratory. It’s all done in one session, and the dentist can shape the sealant if required for a perfect fit. Will I Require Any Follow-Up Treatment? You can expect fissure sealant to protect your teeth from decay for many years. You should visit your dentist every six months for a general check-up. The check-up will include monitoring of the sealant(s), which can then be replaced if necessary. Use an antiseptic mouthwash if recommended by your dentist. Visit your dentist twice a year for a check-up and professional clean. Follow a healthy diet, full of nutritious whole foods and low on processed, sugary and acidic foods and beverages. Quit smoking and drink alcohol moderately. The composite sealant material does have stain-resistant properties. However, just like teeth, if you consume lots of staining foods and beverages, you will notice some discolouration. So, try to drink red wine, coffee and tea in moderation. Also, make sure you swish some water around your mouth, after drinking, so that stains don’t settle on your teeth. You should also avoid bad habits. If you chew your fingernails, nibble on pens, use your teeth to open things or chew on ice and other hard objects, you increase the risk of chipping the seal. This allows bacteria and plaque to form on your teeth. If you notice anything chip off your teeth or you notice a sharp or irregular edge on any of your teeth, you should visit your dentist as soon as possible.